Today, I am feeling blue. Not in a bad way though. I’ve recently been in love with all things nautical. 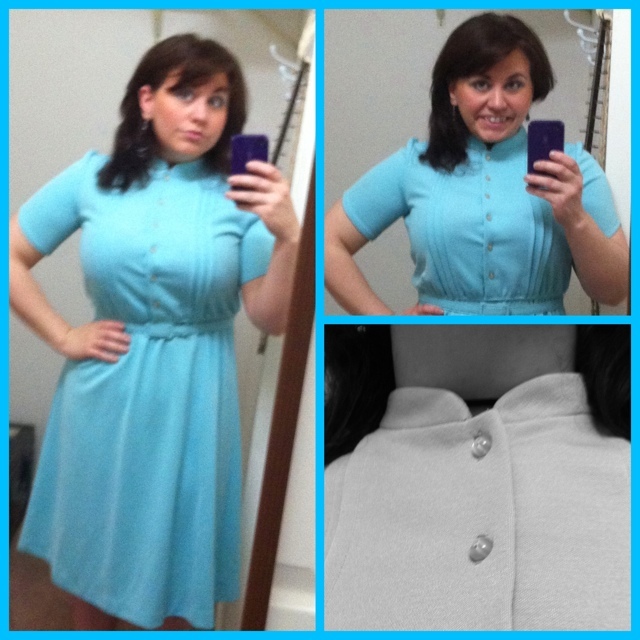 (Which I am now convinced is mandatory for any vintage loving gal.) I’ve amassed several such items over the years and to keep from overflowing, I’ve added many pieces of my personal collection to the shop. Here are just a few that are there, and keep a look out for more!! Navy Shoes Blues: Canvas shoes are the perfect laid back answer to stilettos. Unfortunately for me, they were a little to snug for anything but taking pictures. The Mod Hatter: I acquired this hat several years ago, but because I’m more Elizabeth Taylor rather than Twiggy, it got little use. I still think it’s lovely, but it needs someone to love it. Blue Belle: This dress is a great canvas for all your nautical looks. I wore it with a ‘kerchief around my neck a la’ retro flight stewardess. It’s really an easy care piece; throw it on and go, toss it in the wash, dry and repeat! Nautical Juice Glasses: These pulled together my love for all things nautical and retro in my kitchen. Would be perfect in your coastal kitchen or on your yacht, of course. I was thrilled today when I got a message in my inbox that an item from The Atomic Squirrel had been featured on Oh So Lovely Vintage’s blog. Today’s post was about vintage bar ware! TONS of retro eye candy. If you’ve never checked out their site, you should. These vintage loving gal’s have good taste, clearly they picked one of my items. For those of you who know me in real life,you know that having my own business dealing in “the vintage lifestyle” has been a dream of mine for quite sometime. Today I am one very large step closer to that dream blooming in full. After about a year running my etsy shop under my handle as Candii Hearts, and that entire time knowing that for certain that was not the name I wanted my company to live with for the rest of my life. I wanted something expressly me, and there isn’t a soul who would argue the fact that if I were to be a small woodland creature, it would definitely be a squirrel. So combining my love for the atomic era and my “spirit animal” was not nearly as simple as it should have been. There were lots of factors to consider and I imagine it is a stress similar to naming your child. I sat down this weekend and put together my logo,painted my store sign (see above), updated the store, sent out emails and am still taking care of some of the smaller, more tedious tasks. Right now I’m working on stamps, labels and shirts (which will be for sale). Hey friends. 25% off with code MayDay25 ends tomorrow at Candii <3s Vintage. Lots of stuff to put up next week too, including pretty vintage slips (Oh La La), summer dresses & jewelry! If your are looking for something in particular, let me know as I have an extensive stock of varied vintage items. P. S. If you’d like to be in the know about sales before they happen, get exclusive codes, leave me your e-mail address either here or in a message on etsy and I’ll add you to the list! This Spring has been most productive in the vintage world for me and to celebrate I’m adding some features to the blog and to Candii Hearts Vintage. I’ve been polishing some instructionals to share with you on living the vintage life and I’ve acquired some fun pieces for the shop. If you are interested in being the 1st to know about sales and receiving exclusive discount codes to my etsy shop, send me a message including the email address you’d like to receive notification at and you’ll be added to our mailing list. Your email address will not be used for any other purpose by me besides bringing you great deals, because I HATE SPAM too. You can check out what’s currently available now at Candii Hearts Vintage and recieve 30% off through April 22nd with code SPRINGFEVER30. As always, I hope you are having a wonderful day and I always love hearing from you! Starting on Sunday the 29th of January I’ll be offering a special deal on one item each week….40-50% off! (And if I’m feeling peckish, maybe two!) So keep your eyes open as I’ve got lots of new stuff to add. Do you have your eye on anything special in my shop. Let me know in the comments and I might just feature it. Baby’s Got Her Blue Dress On. A few weeks ago I bought a group of dresses for the shop, and sometimes I Just can’t help but indulge myself in a wear before it goes up. This was one of those items. Another thing that keeps me from putting stuff up…lack of a photographer and/or a mannequin to put things on. I listed my first item yesterday, more for the experience than anything, so it’s not my best work as I am actually quite handy with a camera. It took me all of about 8 minutes photos and all. I like this dress, Love the collar and the pleated bust, but it wasn’t made for curvy girls…even though Thomas said I looked pretty in it and he like it on me.